Alvin® Pavillon Art and Drawing Table Unfinished Wood Top 31" x 42"
Home > Drawing Supplies | Drawing Tables & Art Tables | Alvin® Pavillon Art and Drawing Table Unfinished Wood Top 31" x 42"
This is a table for artists and crafters that offers complete control while being both lightweight and sturdy. 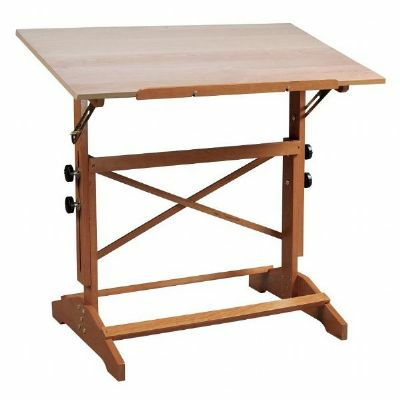 Alvin® Pavillon Art and Drawing Table Unfinished Wood Top 31" x 42" This work table is designed with artists and crafters in mind. It offers them complete control with regards to the height and the angle of the table itself. There is an attached pencil ledge that is secured at the bottom of the tabletop which helps secure your supplies without worrying that anything will roll to the floor if the top is angled. At 34 inches by 42 inches, it can fit nearly anywhere and can be moved around with ease by one person. Weighing 39 pounds, it is very strong and stable so it can be relied upon to support any project or have pressure laid upon it with little to no concern. The unfinished wood surface also makes it ideal for any projects that depend on a smooth, flat surface to be done properly.